This is one of the statues that is most suitable to be described as ‘BIG’. 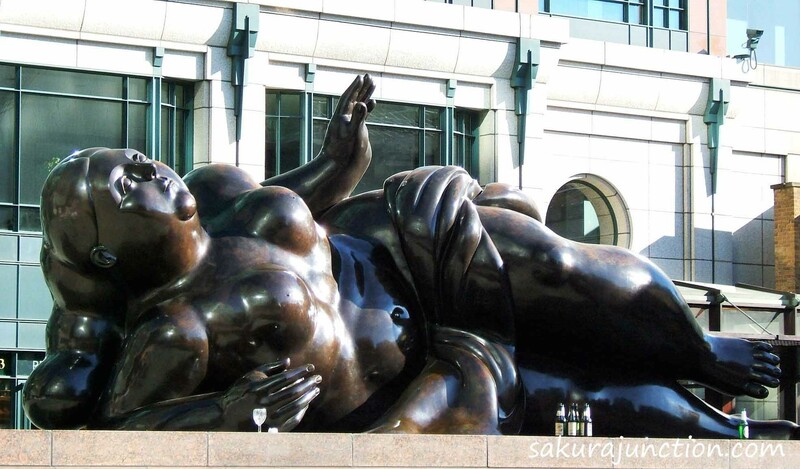 It is ‘Broadgate Venus’ in London. I could not do a point of view shot for this one but just compare it with the size of beer bottles and a glass. The shape and the colour as well as its size make such an impact! In contrast to the Broadgate Venus’s curvy organic shape, the next photo has a very geometrically shaped column and a tall building. 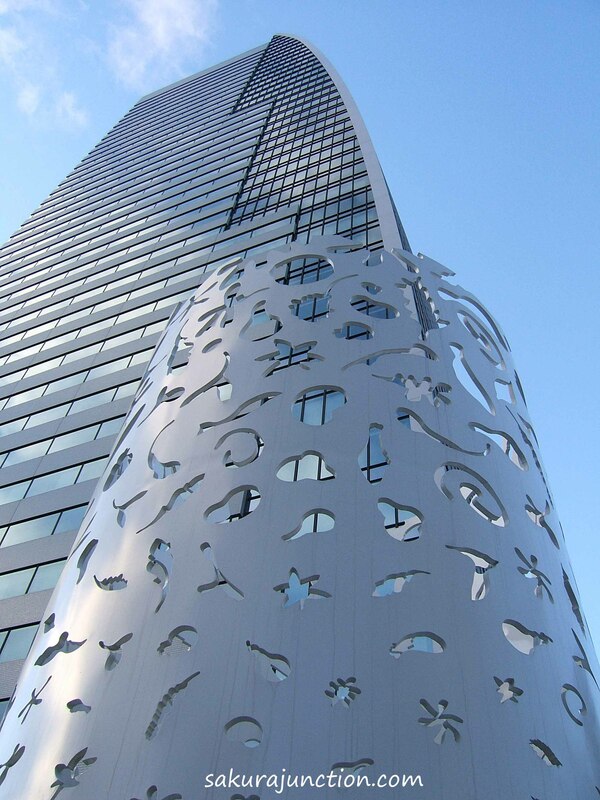 Although they seem to be inorganic with a similar metallic colour and texture, the column has many cut out shapes of leaves & creatures and the building also has a long gentle curve on its side. By being positioned next to each other with precise calculation they look like a perfect combination to me. Curves of a different kind and meaning. Nice pictures. Yes, Curves are great. Thank you. Great photos, both of them. I have a photo of sleeping Buddha, laying like the woman, from Indonesia. Kamakura’s Daibutsu would be great too. But I was thinking of using Warsaw’s landmark – the building that is visible from afar. That is, when I’ll finally catch up with the tasks. Thanks. I thought about either the Kamakura’s or another Daibutsu in Nara first too. Yes, go for the Polish ‘BIG’. Look forward to it. I would have put it already if I hadn’t know that they got extra things for summer. I still haven’t taken those photos. Great interpretations of the theme! Love Venus and wow! Those buildings are fantastic. I love the cool slivers and greys with the blue sky contrasting with the delightful cutouts. Where is this?? The Venus is great if you see it on site situating in a vast square. Wonder whether I managed to capture the impact on camera? The building is in Japan. Exact town? I think it is Nagoya now I’m trying to remember.